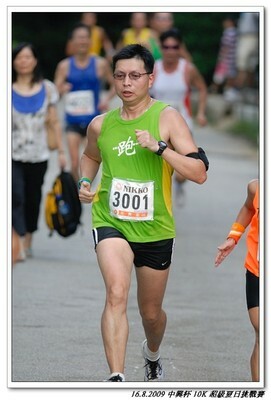 Completed the Chung Hing Cup 10 K 2009 ( 中興盃 荃灣10K - 超級夏日挑戰賽 2009 ) in the extremely hot and humid morning today in 52 mins+. Ran my fifth 10k this year, won for the fourth time. It was great to meet my friends one last time, eventough one of them got cheated out of a medal because of a mistake by the organizer. And great BBQ after the event! Ran the fourth 10k this year, managed to win my age-group again, even though this one is near Frankfurt and quite competitive. Placed 11th over-all among about 240 runners in 39:41. This year they have made it clear that if you can read and write Japanese, you can use the Japanese website for an entry fee of 10,000 yen. If you choose the English/International site, it will be 12,000 yen. The application period end on the 31st. Another age group-victory, extremely small race, but always fun to win! Was fastest over 40 in 40;27 on a hilly course.